Attenborough Cricket Club: Congratulations to our very own Lucas Stentiford! Congratulations to our very own Lucas Stentiford! 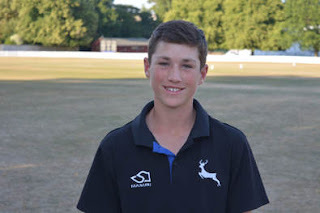 Last week, Lucas scored his first century at the Taunton Festival for Notts U14s. He carried his bat for the full 50 overs ending up on 107*. A massive well done to Lucas from Attenborough Cricket Club. Below is a picture which was taken by the official photographer for the Taunton Festival Hall of Fame! !